King County has a strong network of both public and private organizations working together to improve school food at every level, from childcare to college. The Washington State Department of Agriculture, the Office of the Superintendent of Public Instruction, the Washington School Nutrition Association, Washington Department of Health, Washington State University, Washington Sustainable Food and Farming Network, Seattle Tilth, Northwest Agriculture Business Center, University of Washington, King Conservation District, King County and many other local health departments, nonprofits and school districts are just some of the partners collaborating to seek farm to school programs, establish links between farms and schools, and introduce policies to support farm to school activities. The WSDA Farm to School Program is dedicated to fostering relationships between schools and agricultural producers in Washington State. Our goal is to support expanding economic opportunities for farmers while educating students about the connections between food, farming, health, and the environment. The program provides information, inspiration, assistance, and policy solutions for those working to supply healthy Washington grown food and related education to youth in our State. Identifying local farms and Washington grown products that meet your foodservice needs. Educational resources on food, farming, health and the environment. Model district and school policies that support healthy, local foods and school garden projects. Planning and problem-solving for your specific program. The Farm to School Program works closely with the WSDA Small Farms & Direct Marketing Program, the Office of the Superintendent of Public Instruction, WSU Small Farms Team and other partners around the state to facilitate and improve farm-to-school connections. The WSDA Start-Up Kit provides step-by-step guidance, with links to open the individual tools and resources along the way. Whether you’re new to farm to school, or are interested in resources to support specific aspects of your existing program, it’s worth taking a look. The kit is organized by topic for ease of use. Browsing through each step or jumping right into the topics of your interest, this Start-Up Kit will assist you with developing or furthering your farm to school initiative. Comprehensive Farm to School Information designed to provide farms, schools, families, and communities with resources to help them meet their farm to school goals. Through stories, photos, templates, documents and more, the toolkit highlights farm to school and school garden successes throughout the state and draws together best practices and farm to school tips from our in-state and national network partners. Farm to Preschool is an extension of the Farm to School movement, and incorporates many similar activities designed to promote locally produced fruits and vegetables in a childcare setting. Farm to Preschool is aimed at preschool age children, typically ages 3-5, in any type of childcare setting. Such settings may include preschools, Head Start, center based childcare, programs in K-12 school districts, nurseries, or family home care facilities. This portal by WSDA includes links to curriculum, activities to engage families, health and safety for gardens, and recipes adapted for child care settings with accompanying education and nutrition info. The Farm to Preschool website is part of the National Farm to School Network and designed to function as a clearinghouse of resources from programs around the country and as a means to network with existing and emerging efforts. An 11-part series brought to you by USDA Food and Nutrition Services, guides you through the USDA Farm to School Planning Toolkit. Served up in bite-sized 30 minute webinars, the series offers questions to consider and helpful resources to reference when starting or growing a farm to school program. Guest speakers join the webinars to share their hands on farm to school experiences. Access the videos and webinars at the link below. When purchasing locally-grown food, it is critical that school districts follow federal, state and school district requirements for use of school food dollars. There are a range of policies and procedures on each level that affect school food procurement. 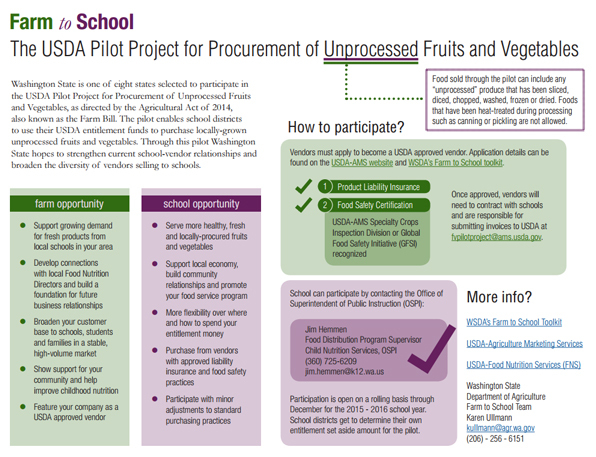 Visit WSDA’s Farm to School Page on Procurement and Geographic Preference to learn more. 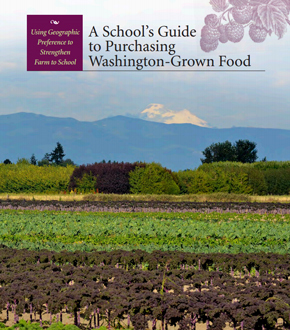 This guide is intended to clarify today’s rules about how to apply a geographic preference in school food purchases and to help school districts increase their use of Washington-grown foods for meal and snack programs. Washington has a fantastic bounty of foods that are a great fit for school meals and other institutional food service. Here you can find general information, recipes, sample menus, and nutrition facts. The Washington Grown Food Kit is an evolving and growing resource. We welcome contributions and will continuously add foods items and resources over time. WSDA and partners have created lots of posters and other promotional and educational materials for Farm to School projects. 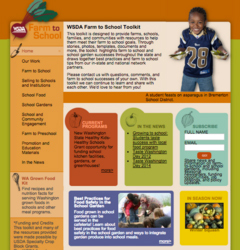 WSDA’s Farm to School Team wants to provide a range of materials and options to help you promote your farm to institution efforts to students and families. 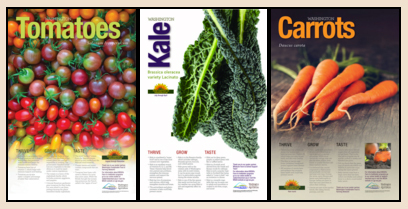 WSDA is pleased to present a set of 20 Washington Harvest posters highlighting terrific Washington-grown fruits and vegetables. Farm to Table is a partnership effort to bring fresh local produce to programs serving children and older adults in Seattle/King County. By making healthy food more affordable and easier to access, our goal is to increase the health and well-being of our communities most vulnerable citizens while providing a new and growing marketing opportunity for northwest Washington farms. 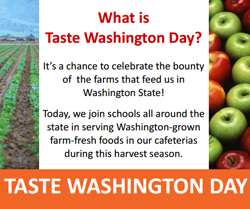 Taste Washington Day, sponsored in partnership by WSDA Farm to School and the Washington School Nutrition Association (WSNA), is an annual celebration of Washington grown foods served in school meals during the fall harvest season. 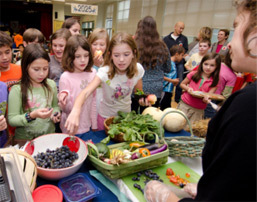 Schools connect with local farms to make the most of our bountiful fall harvest, and use Taste Washington Day to kick-off “Farm to School Month” in October. The Pilot Project for Procurement of Fresh Fruits and Vegetables, is an 8 state pilot program, in which Washington State was selected, as directed by the Agricultural Act of 2014, also known as the Farm Bill. The pilot enables school districts to use their USDA entitlement funds to purchase locally-grown unprocessed fruits and vegetables. Through this pilot Washington State hopes to strengthen current school-vendor relationships and broaden the diversity of vendors selling to schools.